We are available to share training, materials, and coordination for evangelism events and programs within KNCSB churches and associations. 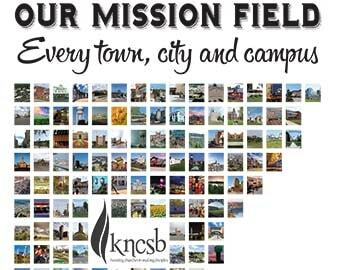 KNCSB EVANGELISM STRATEGY — Our present strategy is to partner with associations, churches, and regional bodies in providing training, material, and financial assistance for special evangelistic events or locally-owned ongoing evangelism emphases. Ministry leaders from KNCSB churches and associations are encouraged to contact our office for assistance in planning and conducting their evangelistic endeavors. Witness Training — Share Jesus Without Fear, The Net, and others. Interfaith Witness Training — We can conduct either associational or local church conferences in assisting believers to share the Gospel across faith lines. We offer conferences with special emphases on cults (Mormons, Jehovah’s Witnesses, etc. ), and relational evangelism with our Roman Catholic friends and relatives. Visitation/Witness Strategy for local churches — V.O.T. E. (Visitation Outreach Team Evangelism) This program incorporates a plan to involve a greater percentage of members in the outreach ministry of the local church. It is very effective, yet not so intense that it burdens the staff and leadership with a taxing week-to-week administration of the program. Witness-related materials such as tracts, books and tapes, both free and cost items. Interfaith Witness Belief Bulletins outlining the history, beliefs, and suggestions for witnessing to those of other faiths. Free upon request in multiple quantities. Tents — The convention owns two large tents that are available to churches and associations for a very modest fee. We are available to assist associations and churches in coordinating evangelism training and events. We can offer suggestions for strategy planning and lists of resources about personnel and materials.